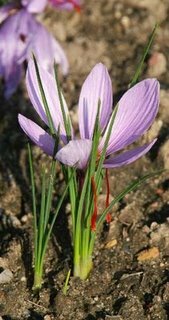 Saffron is a small perennial plant; in springtime, an onion-like corm produces basal, linear leaves which are surrounded as a group at the bottom by cylindrical sheaths. These gray-green leaves have hairy margins and grow to about 8 inches long. About August or September, the corm produces a funnel-shaped, reddish-purple (sometimes lilac or white) flower. These crocus-like flowers appear in late September, and the grasslike leaves can stay green until the following spring and are an attractive feature in the winter garden. Cultivated in many places, but particularly in France, Spain, Sicily, and Iran. When dried, the stigmas produce a glycoside called picrocine which then forms safranal. This has the characteristic smell and the carotenoid pigment of crocine (a very powerful yellow pigment highly valued in the Middle East for the fine quality of yellow dye it yields, even in 1 part per 100,000 it will color water yellow). The most delicately flavored of all spices. Adds golden color and a wonderful flavor to rice dishes, soups, etc. The most expensive of all spices, saffron fortunately needs to be used only in very small quantities. As a culinary herb, it is used for food coloring. True saffron is perhaps the most expensive of all plant products because of the labor involved in harvesting and it takes 3 acres of flowers to produce 1 lb. of saffron. It retails for about $40 an ounce! For this reason few dealers stock this botanical. False saffron, or safflower (Carthamus tinctorius L.) is used much like true saffron. afflower contains 2 coloring principles; the one yellow and the other red. The first is removed by water and used mainly in cooking. The second is used in dyeing fabrics and is easily dissolved out by weak solutions of carbonated alkalies, and is again precipitated with the addition of acid. This property is used to manufacture rouge, and in the dyeing of silk, cotton, and wool. If you wish to collect the stigmata yourself, be sure to plant thousands of saffron, for 60,000 stigmata weight only 1 pound. It takes 50,000 stigmata to make 1 ounce of saffron spice. The stigmata is a small part of the pistil of the flower. At one time, saffron was highly regarded for its medicinal properties. In 1597, the English herbalist John Gerard wrote about saffron as being the remedy for bringing a person back from death’s door. Today, saffron is used primarily used, by those who can afford it, in cooking. Saffron was taken from Arabia to China by Chang Chien, at the same time he took safflower and other Western drugs and plants. Saffron has been used, in small doses only, for coughs, whooping cough, stomach gas, gastrointestinal colic, consumption, quickens the brain, jaundice, and insomnia. Used for menstrual pain, menopause, irregular menses, impotence, infertility, anemia, enlarged liver, hysteria, depression, neuralgia, lumbago, rheumatism, and chronic diarrhea. As an ingredient in herb liqueurs, it serves as a stimulant to appetite; it is sometimes made into a salve for treatment of gout. Reliable used for measles, all skin diseases, and scarlet fever. Will produce profuse perspiration when taken hot: useful for fever, colds, cough, asthma, and the grippe. Regulates and increases the menstrual flow. Blood vitalizer, counteracts inflammatory conditions. Infusion: steep 6-10 stigmas in 1/2 cup water. Take 1/2 to 1 cup a day, unsweetened, a mouthful at a time. Available in a tincture, but is quite expensive. Because it is much cheaper, safflower (Carthamus tinctorius L.) has been used as a substitute for saffron, sometimes under the misleading name of American or Mexican saffron. Saffron contains a poison that acts on the central nervous system and damages the kidneys. Large doses can have severe effects; 10-12 grams is a fatal dose for humans. The high cost of saffron and the availability of synthetic substitutes make its use as a medicine rare. Use only the anthers; corms are poisonous. In large doses it can be narcotic, toxic and even lethal, causing violent hemorrhages. Definitely should not be used during pregnancy; this is a uterine stimulant and may cause miscarriage. 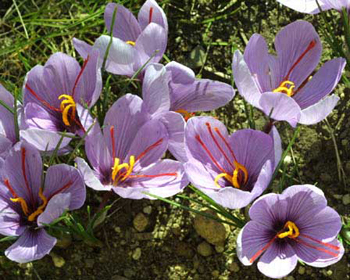 You can grow and harvest your own saffron! Find out more here.